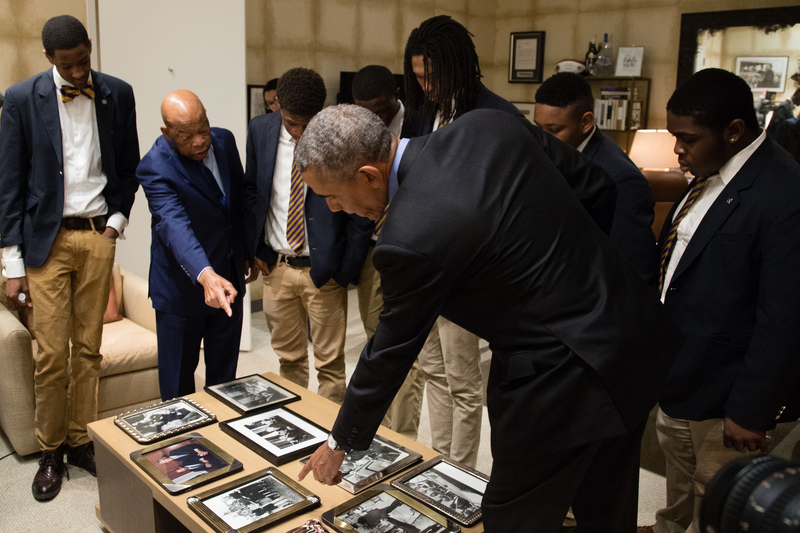 To honor the 50th anniversary of Martin Luther King Jr’s death, President Obama and Congressman John Lewis participated in a My Brother’s Keeper Alliance roundtable with students from Ron Brown College Preparatory High School in Washington, D.C. Watch as President Obama, Congressman Lewis, and the students discuss Dr. King’s legacy and how his mission remains relevant in today’s world. Often, small acts of kindness can be the most impactful thing we can do for each other. We want to hear more about what you’re doing to lift up your community. 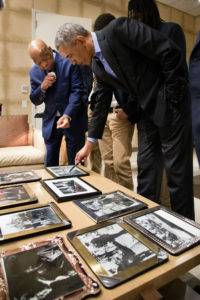 President Obama and Congressman Lewis shared with the students some of the items that connect them to Dr. King, and what they’ve meant to them on the path toward progress. 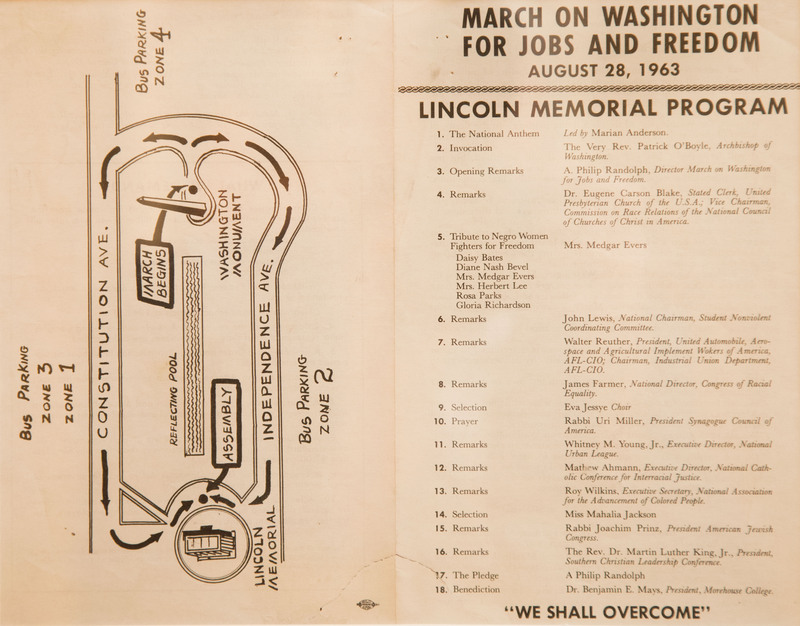 Click here to see the full program used during the March on Washington for Jobs and Freedom that brought 250,000 people to the Lincoln Memorial in Washington, D.C. on August 28, 1963. 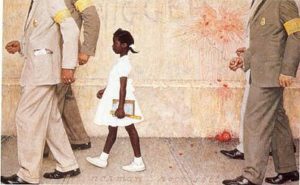 Norman Rockwell’s famous painting depicts the moment in 1964 when six-year-old Ruby Bridges changed history simply by going to school. 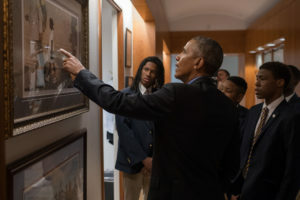 This work was displayed outside of the Oval Office during the summer of 2011. 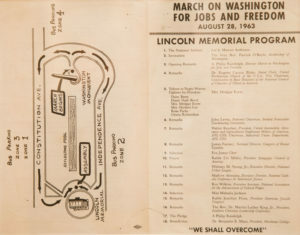 Dr. King speaks to about 25,000 people who marched from Selma to Montgomery to protest discriminatory practices on March 25, 1965. Congressman Lewis brought with him a few of the historic photos that line the walls of his office. 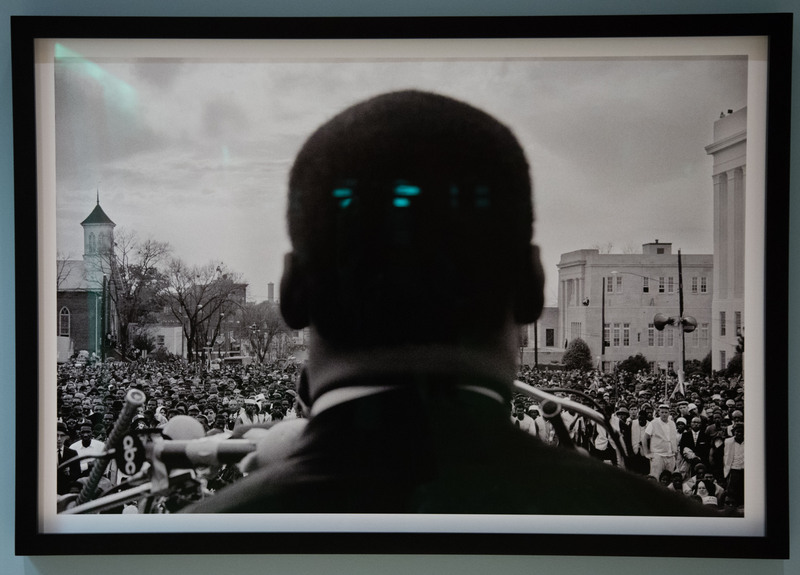 But I’ve also always held the belief that what he left us — the way of hope, the way of peace, the way of love, a philosophy and discipline rooted in nonviolence — cannot be taken away. These things are eternal. 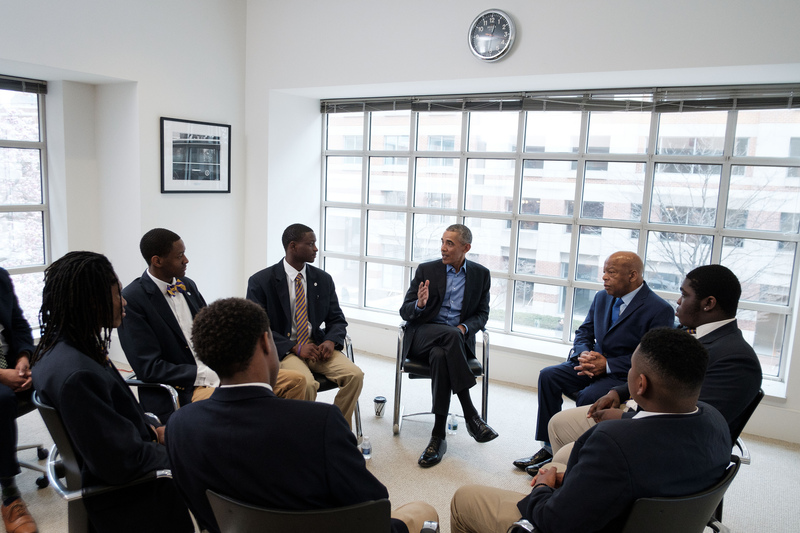 On Monday, I had the privilege of meeting with President Obama and a group of young men in Washington, D.C. for a My Brother’s Keeper Alliance roundtable. Together, we commemorated the legacy of Dr. King, celebrated his life, and looked to the future. And young people are demonstrating that spirit to us. They are organizing and speaking up. They’re marching. They’re demanding more for themselves and their generation. When I was growing up as a child in Alabama, I saw crosses that the Klan had put up. I saw signs that said “white” and “colored.” There were places we couldn’t go. 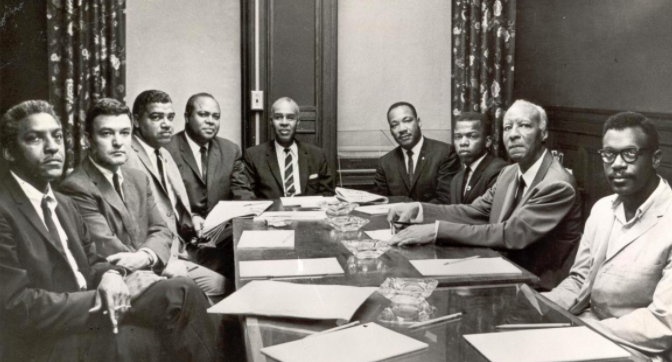 The majority of African Americans could not participate in a democratic process in the South. We could not register to vote. And when I first came to Washington to go on the Freedom Rides in 1961, black people and white people couldn’t be seated together on a Greyhound bus leaving this city. When I got involved in the Civil Rights Movement as a young man, we’d sit in at restaurants. People would spit on us, put their cigarettes out on us, pour hot coffee down our backs. I was arrested 45 times in the 1960s. I was beaten, left bloody and unconscious. 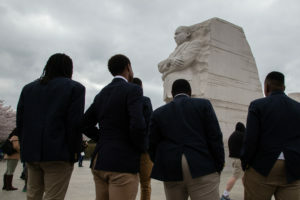 Dr. King taught us to be brave, to be courageous, to be bold. I don’t know where America would be, where many of us of color would be, were it not for him. His legacy was to speak up, stand up. When you see that something isn’t right or fair, you have to do something — you have to get in the way. 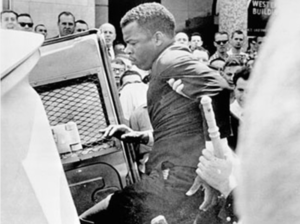 Get into good trouble.